- There is a major problem at the Hi-Boost switch connections: Hi Boost SW1 does not connect to anything, the 8uF from Q2's emitter connects to a 390pF cap which goes to ground and the 180R resistor that should connect the 8uF cap to ground just "hangs" there connecting to nothing. Also there is a cut missing there, as this way the Lo-Boost SW1 connects to the 8uF cap as well. hey man. i'll have to see if the schematic i have is the same as the one one FSB and make changes as necessary. for now i'll put it on hold. Yep, my next question should have been if you have used the FSB schematic :) There are too many deviations... Though if you did use another one, then I'M afraid that in some points that schematic is wrong. E.g. : the last cap going from Q5's base to the Level pot is certainly wrong, the output buffer would then be completely bypassed. thanks man. so i went back and made the corrections. there were a few others i spotted as well that should now be correct. the board grew 1 more column and added 1 more link, so not terrible. the switches should be right, since they work independently now instead of together. the hi-boost SW1 is connected to the + leg of the 8uF, the - is connected to the 180r to ground. hi-boost SW2 is connected to the E of Q2. the lo-boost switch is just SW1 390pf to ground, and SW2 to B of Q5. 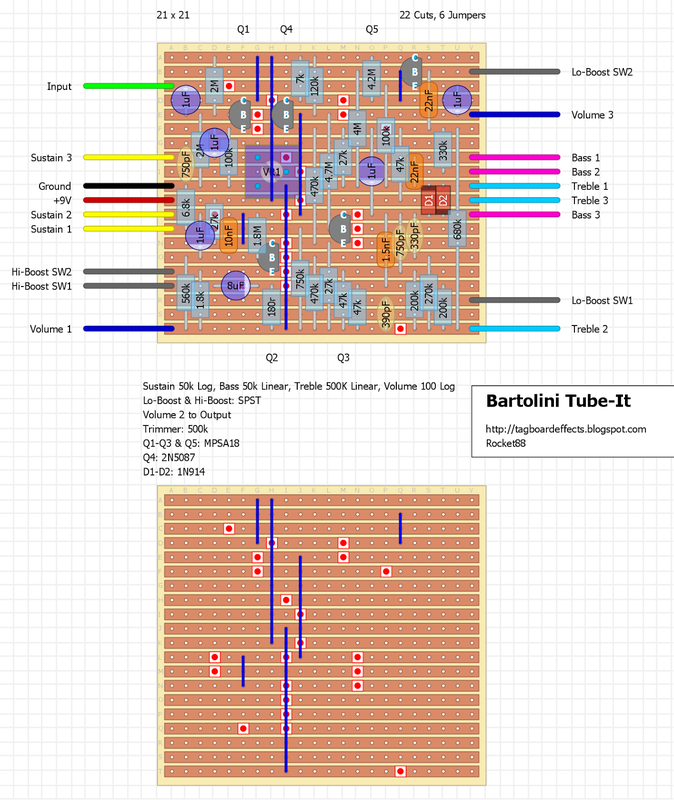 Just type in bartolini tube it in the search box on fsb then scroll about half way down the page you will see it. just added to the notes that Volume 2 to Output. must have deleted it when moving stuff around and didn't notice. correct. that was not supposed to be like that, each spans 1 more row then it should. went back over the layout with the schematic to see about the area around the sustain, but it looks right to me. what to do mean something is wrong with that area? did you build it and use scope it? ok. what will be a tremendous help is to use an audio probe to figure out where the sounds stops in the circuit this will help be able to figure out where the problem is within the layout. 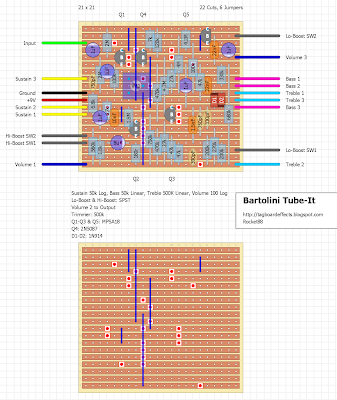 i'm going to go back through the layout and check it against the schematic again and see if there's anything i missed. the one cap is backwards going into sustain 3, but that i don't think that's the problem with the layout. but out of shits and giggles flip that cap and see what if that gets it working. Only thing I see is the electrolytic capacitor is turned backwards coming off the sustain and is backwards in the input to. Don't it have to run through the + side first I have never seen a capacitor turned backwards like that. And what about the 7k resistor with a ? Beside it. The orientation of the electrolytics at the input and sustain are correct. The + side of the cap simply goes to the side with higher voltage, and of course the transistor has a higher voltage than your guitar. I haven't looked at the whole schem, but while looking at that part I see that Q1 has the 2M and link from 9V mixed up. so ... interchange E jumper with 2M resistor ?? .... i try this , i think you right ! .... thanks all ! great pascal. what did you change so that it's working right so i can make the correction on the layout. also, how does it sound? i've been curious about it based on it's description, but couldn't find any videos with it. That tone stack is the most craziest one I have ever seen. I can't wrap my head around it how it even works. What is all the capacitors and resistors above the bass pot doing? I think I'm going to bread board it first to see if I like it. I seen a video of a guy with one sounded good. I guess if the tone stack dont sound that good would it be possible to try different tone stacks with it like the fmv tone stack. I have a couple questions about the cuts and jumpers. There seems to me a discrepancy between the 2 drawings. Is the short jumper supposed to be on column L or Q? Also the is the cut supposed to be on D-M or D-K? Theres only 1 layout posted, so I'm not sure what 2 drawings you're talking about. But there's a jumper at column Q row B-D. There is a cut at column D row M and another at column D row L.
Sorry, I am new to vero boards. I mean the upper board with the components pictured and the lower one without components. The one jumper and cut seem to be in different spots. Cut on Row D, Column M or K? Jumper row B to D in Column Q or L? Btw, not sure how new you are to building, but I would build something easier then this if you're starting out. This can be a bit of a bear to debug if there's any issues. I've built quite a few pedals but never on vero board. It seems pretty intuitive as it is basically an extension of breadboarding. I'm sure i can get this to work, I was just confused on those 2 things. Thanks for the quick responses. This looks like an amazing pedal and I can't wait to get it built!